In-depth Advanced Web Ranking review. Get an insider's grasp of AWR. If you've been thinking whether to buy Advanced Web Ranking, you'd probably want to compare Advanced Web Ranking to other SEO tools and make an informed decision. We've run a thorough comparison of Advanced Web Ranking and SEO PowerSuite, so you can compare features of Advanced Web Ranking and SEO PowerSuite or read the full review here and decide what software will work best for you. As an old-time song has it: "The Winner Takes It All". Thousands of loyal visitors, never-ending flow of traffic and skyrocketing sales — that's what top position of your website in search results brings. But the web space is getting too crammed with folks willing to push their sites to the top of Google. That means you have to do your best to achieve and maintain the desirable online supremacy. It's a hard task to do barehanded, but if you are armed with cutting-edge SEO tools you're ahead of the game! Powerhouse SEO tools – that's what you need to beat online competition and tower up in search results. The obvious advantages of good SEO software can be summed up in three words: speed, effectiveness, money-saving. Speed: Advanced SEO tools let you automate website optimization process and even run certain tasks on autopilot. SEO software lets you gather and process large chunks of data much faster, and you won't even need to sit in front of the computer most of the time. You can devote your free time to other business activities while smart SEO tools are doing all the spadework for you. Effectiveness: With the state-of-the-art SEO software you're almost guaranteed to get high rankings in search results with no pain and far less effort. Battle-proven results of using SEO tools speak for themselves. Money-saving: You can save up pretty penny, since SEO companies and next-door SEO gurus use the same SEO software and charge top dollar for their services. Having SEO tools in your arsenal lets you promote your website on your own, cutting the hefty expenses. Today the SEO software market offers you a wide range of SEO tools. But how do you pick the software that will really work for you? The only way to make the right choice is test SEO tools in practice. In this review we are going to walk through the main stages of SEO process and tackle the optimization challenges using two popular SEO toolkits: Advanced Web Ranking (AWR) and SEO PowerSuite to see how they stack up against each other. To set the ball rolling let's outline the list of SEO aspects and tasks SEO tools must do perfectly well. 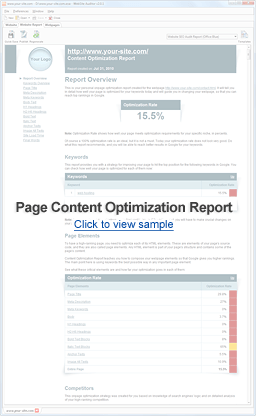 Onpage optimization is the cornerstone of your SEO campaign. Basically onpage SEO refers to things you do on your site to increase its ranking potential. There are a number of aspects to it: site structure, navigation, code optimization, proper use of keywords, indexation and internal linking, etc — all these things need to be seen to. The final goal of onpage SEO is to make your site and webpages easily accessible and 'read' by the search engine crawlers or in other words — make them search engine friendly. Your website's rankings are like a litmus paper that indicates the ups and downs of your SEO process. That's why you should know where your website stands in search results to channel your optimization efforts in the right direction. Manual rankings monitoring is a tedious time hog. Even if you monitor as few as 10 keywords in 3 search engines, you need to perform about 30 to 300 (10 keywords x 3 engines x 1to10 results pages) individual searches to find where you rank. Sounds terrifying? A good rank checking tool will turn that painstaking burden into a mouseclick job! It will check your rankings, keep your rank history and generate detailed reports — with little to no effort on your part. In a word, a good rank checker is a huge time-saver for every SEO. Off-page SEO refers to the work you execute outside your website, hence the name. The two major aspects here are competition research and link building. Have you ever wondered why a certain website ranks well for a particular keyword? With a bit of competition research you can learn exactly what they did to get there. What are their onpage techniques, where their backlinks come from, what keywords they are targeting, etc. — you can figure that all out with the help of SEO software. And yes, your competitors are watching you, make no mistake about that, so you need to do the same thing and do it better to stay ahead. If your website is the ship, backlinks (links to your site from other sites) are the fuel that drives it to the top of search results. The more and better quality backlinks you have the higher your site ranks. That's why link building is so vitally important for SEO. And now let's switch from theory to practice. It's high time we brought AWR and SEO PowerSuite into play to see which SEO tool can handle optimization challenges faster and more effectively. Now you can have a brief look at all the features of these two SEO tools in the feature-by-feature Advanced Web Ranking vs SEO PowerSuite comparison chart, or read on to see the complete review. When you first launch Advanced Web Ranking you may feel a little bit frustrated, since the interface of this software is quite stiff. It feels like all its features are thrown at your face, which makes focusing on some particular task pretty difficult. SEO PowerSuite has a more user-friendly interface. It's equipped with customizable workspace filters that let you easily unclutter your working area and get access to the information you need, when you need it. If you're just starting out in SEO you may need a little help getting around every stage of website optimization. Advanced Web Ranking includes a 27-chapter User Guide. It's pretty detailed but you may find it a bit difficult to find the info you need unless you know exactly where to look. No need to switch back and forth between the tabs and twist your brain reading tons of complicated information with SEO PowerSuite. Step-by-step SEO PowerSuite wizards give you a helping hand and guide you through all stages of the SEO process with easy-to-follow instructions. Even an absolute SEO beginner can apply the advanced techniques that used to be an SEO expert's unfair advantage! Depending on what SEO task you're running, SEO tools will need to make quite a lot of queries to search engines to fetch all the data you need. When search engines receive too frequent queries from the same IP address they may temporarily stop processing them to spare their servers. Whenever this happens you have to wait a bit (usually a couple of hours) till you can continue working with them. Obviously that's the last thing you would want to happen when you have a report to deliver to your client, or a presentation to make. That's why modern SEO tools have special mechanisms that shield you from getting temp search engine blocks and ensure a seamless working process. Advanced Web Ranking provides such safety features as Browser Emulation and Proxy Rotation. SEO PowerSuite ensures much more solid protection using advanced search safety mechanisms. Besides Human Emulation (the analogue of AWR Browser Emulation) and Proxy Rotation methods it uses Random User Agents, which altogether makes search engines assume that queries are sent from different people. It also lets you use an automatic CAPTCHA recognition service. Besides, both SEO tools are fitted with API keys that let you safely query the search engines. Both Advanced Web Ranking and SEO PowerSuite support Google, Yahoo! and Bing API keys. Advanced Web Ranking lets you generate different kinds of reports on particular aspects of your ranking progress. The reports are mostly plain-data so they look a bit 1999-ish. If you're looking for an eye-candy to impress your clients look elsewhere. Though if you're going to generate reports just for yourself and don't care about the looks they should work for you. 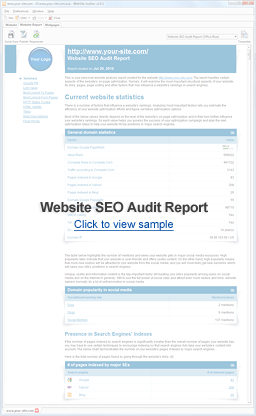 While carrying all the necessary stats and data SEO PowerSuite reports look more professional and eye pleasing. The benefits of SEO PowerSuite reports are obvious, but it's just the half of the deal! SEO PowerSuite Reports will be your personal SEO counselor and guide, that will show you the little-known optimization tricks, walk you by the hand through all the stages of SEO process and show you the way to the ultimate online success! Keyword research is a critical aspect of your SEO campaign. You need to know what search terms your prospective clients will use to search for your or similar products and services online. People have different search habits and while James will search for 'plumbers' to have his pipes fixed, Simon will run a search for 'leaky pipes' to find a plumber. A good keyword research tool will help you locate the most popular and relevant keywords to optimize for and will ensure that you don't miss out on great keyword opportunities. Advanced Web Ranking has an onboard Keyword Research Tool with 8 different keyword research methods, which is quite good. Its built-in browser opens the web-pages of on-line tools, such as 7 Search, Google AdWords, Miva, Wordtracker etc. and you can extract and import the keywords they suggest. But, as AWR simply opens third-party tools in the internal browser, this makes keyword research process pretty frustrating and time-consuming. You'll have to close-examine website navigation of all those online services to figure out how they work. Moreover you'll even have to create an account with these services to get access to their keyword suggestion tools. So basically AWR acts more like a browser here rather than a keyword research tool, since it gives you a browser access to otherwise free services with no added value and you still have to do all the clicking. What's the point of that? SEO PowerSuite Keyword Research Module provides 16 keyword research methods including Google AdWords and Google Search-based Keyword Tools, Google Suggest, Yahoo! Search Assist, Ask TypeAhead, Wordtracker, SEMRush and many more for across-the-board keyword research. You don't need to jump from site to site and manually collect the keyword suggestions. You just enter a couple of seed terms and SEO PowerSuite will get the job done in a click! You can make use of several or all 16 keyword research methods whenever you need to expand your keyword list. Hard to believe? Let's test these two SEO tools and see what they can do. We give Advanced Web Ranking and SEO PowerSuite two absolutely identical tasks and figure out who is the real champion in harvesting keywords. Let's say you are running a restaurant business and you want to promote your site for 'sushi' as your main keyword. You enter that word in Google and see that the number of competing web pages for that term is 38,200,000. It's pretty tough to tower over all those guys. But no panic! Just find the words with lower competition and still high search rates and you'll get your piece of pie. Let's check what Advanced Web Ranking can suggest. OK, 1,129 keywords (including the results of regional keyword suggestion tools). Not bad. However, when we were using some keywords suggestion mechanisms we faced serious problems extracting keywords and importing them into our project. All the buttons in the lower part of the window such as 'select all', 'extract keywords', 'extract stripped keywords' and others were inoperable, so we couldn't extract and use those words in our project. And now let's have a look at SEO PowerSuite results. It discovered 1,942 keywords for your site, that is 813 keywords more than AWR. Moreover, you won't have to read tealeaves to guess what keywords will drive more organic traffic to your website, because SEO PowerSuite determines the value of keywords for you. It uses the SEO know-how: Keyword Efficiency Index (KEI) that compares the search volume of a keyword against the number of competing web pages. This helps you find out which keywords have best traffic-generating potential and optimize your site for them. With SEO PowerSuite you'll be able to do keyword research in the twinkling of an eye and generate a long list of highly targeted keywords that will bring loads of organic traffic. SEO PowerSuite is a full-fledged keyword generating lab at your fingertips! One of the most popular sayings with webmasters and SEOs states that 'Content is King'. But it's only partially true. The concept of 'build it and they will come' doesn't work anymore. To get more eyeballs to your copy you need to get out there and promote it. And SEO is one of the most effective ways to do it. Now let's see how Advanced Web Ranking can help you with content optimization. The software is fitted with Keyword Analysis tool. It shows you the info about keyword density and prominence in various HTML elements on your webpage. You can also compare your webpage against one of the competing pages and get the ballpark idea on where your content is not quite up to scratch. As you see, Advanced Web Ranking can provide some useful analytical data about on-page SEO, but what do you do with that data next? Alas, AWR gives you no answer to that question. It washes its hands off leaving you face-to-face with the problem of optimizing your website content. Now let's see what SEO PowerSuite has to offer in terms of content optimization. SEO PowerSuite uses a unique two-layer approach to onpage optimization. First it lets you optimize your site as a system to make sure you're fulfilling its ranking potential to the max. Then it helps you optimize your particular pages for your target keywords in your search engines of choice. Once you've optimized your site across-the-board you can promote specific webpages for your target keywords. Here's how this works. First, SEO PowerSuite collects the data on your webpage and your top 10 on-line competitors in a couple of seconds. It houses all the info about your webpage in a big detailed chart. You can not only get detailed information about keywords for each webpage element, but also learn how much weight a particular keyword has for search engines in a score column. 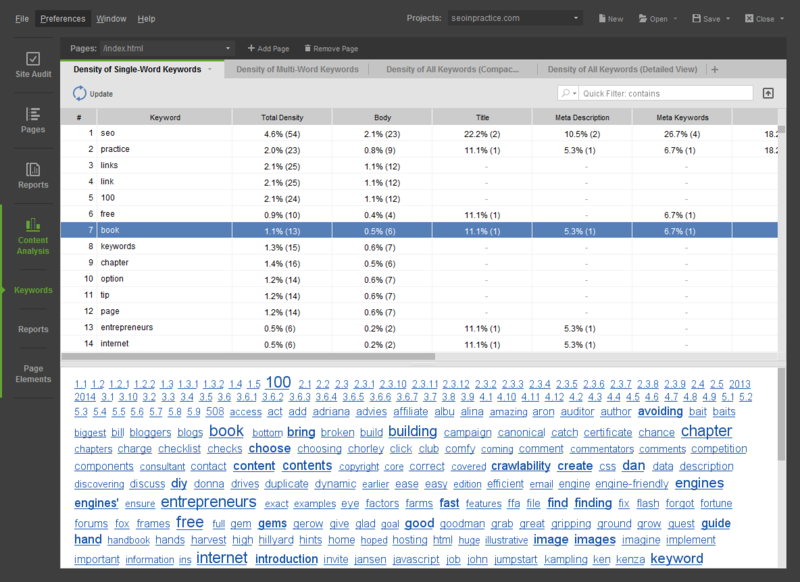 The cloud map below gives you a visualized picture of your keywords' importance. With SEO PowerSuite advanced workspace filters you can switch to single-word, multi-word keyword filters or choose a particular keyword you need with a quick filter. All that makes on-page optimization process a breeze. Second, SEO PowerSuite guides your every step in on-page SEO, channeling it in the right direction. SEO PowerSuite's reports will be your personal tutor giving you step-by-step guidelines on every stage of onpage SEO. Which tool makes the running at rank checking? Advanced Web Ranking and SEO PowerSuite go nip and tuck in rankings check. They both help you track your website's ranking fluctuations over time and provide accurate results. Competition research and link building: Advanced Web Ranking vs SEO PowerSuite — the final smackdown. Only having done all that you can come out as the winner. Unfortunately Advanced Web Ranking is not equipped with the features to handle off-page optimization tasks. It says you 'bye-bye' leaving halfway in your website optimization process. For competition research and link building Caphyon Ltd. Offers a different software product Advanced Link Manager. But to supplement Advanced Web Ranking with Advanced Link Manager to cover all aspects of SEO process you'll have to shell out 798$ for both. The only thing that Advanced Web Ranking can offer for off-page SEO is a quasi 'Submitter.' It's supposed to help you submit your website into different search engines and directories. But after close-examining this feature you realize that it isn't worth a red cent. The so-called 'Submitter' is nothing but a list of search engines and directories. The built-in browser opens the pages with submission requests forms and you enter all the details manually. Moreover, search engine submission doesn't help your rankings a notch. When it comes to competition research you want to know where your competitors get their best links. Most SEO tools show you only a small profile of competitors' links leaving out a lot of link sources. SEO PowerSuite digs up to 50, 000 backlinks for a specified website (most SEO tools don't go past 1,000). It evaluates each link according to 26 ranking criteria and helps you select only the best ones. It keeps an eagle eye on your link partners, checking whether they link back, so not a single drop of link juice will leak from you. All-in-all SEO PowerSuite beats Advanced Web Ranking by miles. Unlike AWR SEO software, SEO PowerSuite uses the most advanced technology in the SEO industry and gets updated every time a new SEO trend appears. (Go here to see feature comparison) SEO PowerSuite can work for a newbie, or run in an expert mode. Thanks to the task Scheduler you can leave SEO PowerSuite tools working and you won't even need to sit in front of your computer. SEO PowerSuite is also cross-platform (Windows, Linux, Mac OS X) and is available in several languages. More to that, no other software can compete with SEO PowerSuite in terms of Customer Support quality. But don't take our word for it. Download Free Edition of SEO PowerSuite, test it and see for yourself whether this SEO toolkit is right for you. If you already own Advanced Web Ranking, you can exchange your license for a competitive discount on SEO PowerSuite.